Get 250 welcome WestJet dollars^. First checked bags free for the primary cardholder on WestJet flights†. Travel to Canada and the Continental US for $99 CAD^. Travel to Hawaii, Mexico, Central America and the Caribbean for $299 CAD^. Travel to the rest of the WestJet network for $399 CAD^. Plus taxes, fees and charges^. Earn 250 welcome WestJet dollars^. 1.5% back in WestJet dollars‡ on everyday purchases˜. 2% back in WestJet dollars on flights or packages with WestJet or WestJet Vacations‡,˜. Use WestJet dollars toward all or part of a WestJet flight or WestJet Vacations‡ package*. Redeem WestJet dollars at any time*. No blackout periods, seat restrictions or advanced booking required. Mastercard Concierge Service**. Exclusive last-minute access to favourite restaurants, event tickets and more - available 24 hours a day, 365 days a year. Mastercard Airport Experiences Provided by LoungeKeyΔ. Membership to 800+ airport lounges worldwide (fees apply for lounge access) and access to exclusive offers from luxury retailers. Download the Mastercard Airport Experience app and register. Would you like another WestJet credit card option? 1% back in WestJet dollars‡ on everyday purchases˜. 1.5% back in WestJet dollars on flights or packages with WestJet or WestJet Vacations‡,˜. Redeem WestJet dollars at any time∆. Registered trademarks of WestJet Airlines Ltd. WestJet dollars and WestJet Vacations are registered trademarks of WestJet Airlines Ltd. All other trademark(s) are the property of their respective owner(s). Petro-Canada is a trademark of Suncor Energy Inc. Used under licence. You will earn up to 1.5% back in WestJet dollars on your everyday purchases and up to 2.0% back when you purchase WestJet flights or WestJet Vacations packages, depending on the card you choose. The additional 0.5% back in WestJet dollars is calculated separately and is in addition to the WestJet dollars you earn on everyday purchases, however it may not be accrued under certain circumstances. 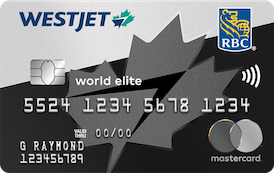 In order to receive the additional 0.5% in WestJet dollars, WestJet or WestJet Vacations must appear as the merchant on your credit card statement. 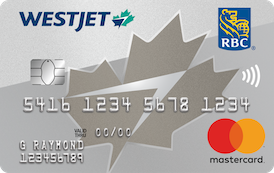 WestJet dollars are earned on net purchases only; they are not earned on cash advances (including balance transfers, cash-like transactions and certain bill payments), interest charges or fees, and credits for returns and adjustments will reduce or cancel the WestJet dollars earned by the amounts originally charged. WestJet dollars can be used towards payment of the base fare of an eligible flight or vacation package, available on westjet.com or through WestJet’s contact centre. WestJet dollars cannot be applied against taxes, fees or charges and can only be used for new bookings. Minimum redemption rules apply and may vary. Other restrictions may apply and are subject to change at any time. Full details available at westjet.com/redeem. All terms, conditions and restrictions applicable to WestJet Rewards are established by WestJet and shall apply to all bookings, travel arrangements and other services offered or provided by WestJet. WestJet, not Royal Bank of Canada, is responsible for WestJet Rewards. Only available to residents of Canada. Once approved for the WestJet RBC MasterCard, please allow 4-6 weeks after the first purchase transaction date for the 50 welcome WestJet dollars to appear on your credit card statement. Once approved for the WestJet RBC World Elite MasterCard, please allow 4-6 weeks after the first purchase transaction date for the 250 welcome WestJet dollars to appear on your credit card statement and for the welcome companion flight voucher (the "Flight Voucher") to appear on your WestJet account, accessible at westjet.com. 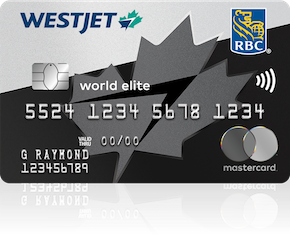 The Flight Voucher is offered to new WestJet RBC World Elite MasterCard cardholders only, and annually thereafter upon their credit card anniversary date. Primary cardholder may use the companion flight voucher only once on their choice of A) $99 CAD (plus taxes, fees and charges) round-trip flight for travel in Canada and the continental U.S.; B) $299 CAD (plus taxes, fees and charges) round-trip flight for travel to/from Mexico, Central America, the Caribbean and Hawaii; or C) $399 CAD (plus taxes, fees and charges) round-trip flights to/from the rest of the WestJet network. The Flight Voucher may only be used if the companion is travelling with you on the same itinerary. Applicable taxes, fees and charges on the Flight Voucher are the responsibility of the traveller and must be paid at time of booking. Flight Voucher is available on all published eligible fares marketed and operated by WestJet. Flight Voucher is available on all published eligible Basic, Econo, EconoFlex, Premium, and Premium Flex fares wholly marketed and operated by WestJet and may only be used if the companion is travelling with you on the same itinerary. Not valid on Business, BusinessFlex, or Member Exclusive fares. Flight Voucher pricing differs based on origin and destination. The Flight Voucher is only valid for new bookings made through westjet.com or WestJet’s Service and Sales Centre, cannot be applied to existing reservations and is not valid for group bookings or WestJet Vacations bookings. Additional cardholders, as well as existing WestJet RBC World Elite MasterCard and WestJet RBC MasterCard cardholders, are not eligible for the welcome offer or welcome Flight Voucher offer. This offer may not be combined or used in conjunction with any other offer. Terms and of the Flight Voucher are established by WestJet and WestJet reserves the right to change or withdraw this offer at any time. Visit westjet.com/creditcard for complete details. Valid for primary cardholders of the WestJet RBC World Elite MasterCard and up to eight (8) additional guests travelling on the same reservation; not valid for companions when travelling on a group booking (10+ guests on the same reservation). Eligible member’s 9-digit WestJet Rewards ID must be on the reservation at the time of check-in. Valid on itineraries marketed and wholly operated by WestJet; not valid when travelling with WestJet’s code-share or interline partners. Size and weight of baggage must comply with WestJet’s standard checked baggage allowance. Any piece of baggage exceeding the size or weight allowance is subject to all applicable oversized weight and size restrictions and fees. More details. May only be used as described and has no monetary or other exchange value. Each time you use your linked Eligible RBC Card to purchase any grade of gasoline, including diesel, at a Retail Petro-Canada Location, you will save three cents ($0.03) per litre at the time of the transaction. Card linking may take up to 2 business days to process before savings and bonus points can be applied to purchases. The Concierge Service (“Service”) is being provided as a benefit to World Elite Mastercard cardholders. The goods and services cardholders request or otherwise choose to obtain through the Service are provided by various third party service providers unrelated to RBC. RBC does not endorse, review or qualify these service providers. RBC makes no representations or warranties (either express or implied) about, and assumes no responsibility or liability for, these service providers or the goods and services that may be obtained through the Service. Royal Bank of Canada is not responsible for any claims or damages arising from the use of any benefits or services provided by a third party. RBC cannot guarantee the successful fulfillment of cardholders’ requests in all instances. There is no fee for the Service, however cardholders are responsible for the cost of any goods or services (including any related fees or costs) authorized by the cardholder and purchased by the Service on the cardholder’s behalf. All costs will be charged directly to the cardholder’s World Elite Mastercard card. RBC is not responsible for the Service. RBC reserves the right to modify or cancel this benefit at any time and without notice. Mastercard Airport Experiences, provided by LoungeKey, are being provided as a benefit to cardholders with eligible and valid World Elite Mastercard cards. Each eligible World Elite Mastercard cardholder is entitled to a complimentary membership to LoungeKey Airport Lounges (as long as they remain a World Elite Mastercard cardholder). Access to participating LoungeKey Airport Lounges is at the cost of US$27 per person (subject to change), per visit, and lounge access charges will be billed to the World Elite Mastercard card connected to cardholder’s LoungeKey membership. To view a full list of participating LoungeKey Airport Lounges, their facilities, opening times and restrictions cardholders can visit http://airport.mastercard.com. By using this service, you agree to all LoungeKey’s terms and conditions, including privacy and security policies available at http://airport.mastercard.com. These policies may be amended and/or updated at any time and without notice. RBC is not responsible for any claims or damages arising from use of LoungeKey Airport Lounges. RBC is not responsible for this benefit. RBC reserves the right to modify or cancel this benefit at any time and without notice. Coverage underwritten by Desjardins Financial Security Life Assurance Company. Coverage underwritten by RBC General Insurance Company. Certain coverage underwritten by RBC General Insurance Company in the Province of Quebec and by RBC Insurance Company of Canada in the rest of Canada.